A fluid-filled compartment inside a cell, surrounded by a membrane. 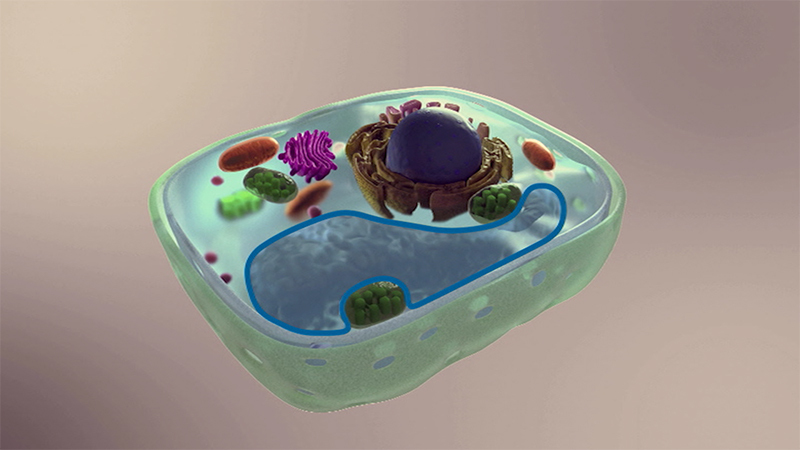 A fluid-filled compartment inside a cell, surrounded by a membrane. All plant cells contain a large, permanent vacuole, used to store substances such as water, salts, and molecules that breakdown waste products. The vacuole also helps maintain the cell's shape and structure, by swelling with fluid and exerting pressure against the cell walls. This is known as turgidity; without it, the plant's cells and tissues would lose their firmness, causing the stem and leaves to wilt. All plant cells contain a large, permanent vacuole, used to store substances such as water, salts, and molecules that breakdown waste products. The vacuole also helps maintain the cell's shape and structure, by swelling with fluid and exerting pressure against the cell walls. This is known as turgidity. Without it, the plant's cells and tissues would lose their firmness, causing the stem and leaves to wilt.